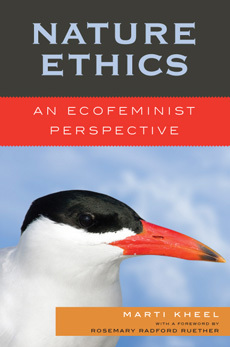 In Nature Ethics: An Ecofeminist Perspective, Marti Kheel explores the underlying worldview of nature ethics, offering an alternative ecofeminist perspective. She focuses on four prominent representatives of holist philosophy: two early conservationists (Theodore Roosevelt and Aldo Leopold) and two contemporary philosophers (Holmes Rolston III, and transpersonal ecologist Warwick Fox). Kheel argues that in directing their moral allegiance to abstract constructs (e.g. species, the ecosystem, or the transpersonal Self) these influential nature theorists represent a masculinist orientation that devalues concern for individual animals. Seeking to heal the divisions among the seemingly disparate movements and philosophies of feminism, animal advocacy, environmental ethics, and holistic health, Kheel proposes an ecofeminist philosophy that underscores the importance of empathy and care for individual beings as well as larger wholes. Chapter Two – Masculine Identity: Born Again "Man"
Chapter Four – Thinking Like a Mountain or Thinking Like a "Man"?